Photo of spoke wheels made of shaganappi (rawhide) on a Red River cart on display at Fort Walsh National Historic Site, Cypress Hills Interprovincial Park, Saskatchewan, Canada. 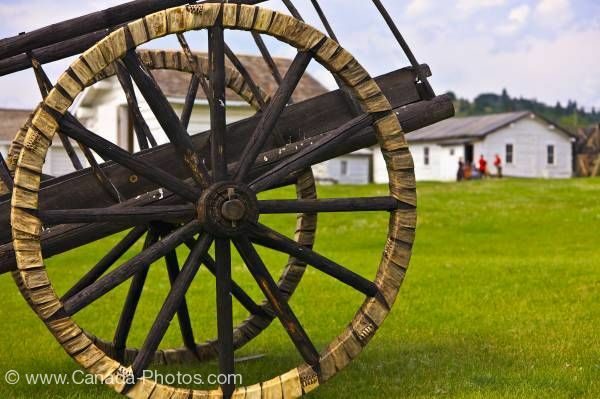 A Red River cart sits on display on the green lawns of Fort Walsh National Historic Site. The cart is made of wood and animal hide; no man made materials were used to make the carts. The two large spoke wheels are wrapped with shaganappi (rawhide). Spoke wheels of a Red River cart with tires made of shaganappi (rawhide) on display at Fort Walsh National Historic Site, Cypress Hills Interprovincial Park, Saskatchewan, Canada.